This paper investigates the use of dark humor in the Anzac soldiers’ diaries and letters recounting their experiences in the Gelibolu battlefield. It aims to illuminate the psychological mechanisms and functions of war time humor through a philosophical perspective. The ideas of selected classical and contemporary philosophers and critics on the concept of the comic help us understand why many of the most painful and violent scenes described in the soldiers’ narratives involve dark humor. The texts we study reveal that not only the Anzacs but also the Turkish soldiers had recourse to humor sometimes to communicate with the enemy when the trenches between the two sides could be measured by only a few meters, and at other times to poke fun at the combative competence of the Anzac soldiers. However, we do not have any personal accounts of war written by the private Turkish soldier. The Anzacs were better educated than the Turks and they were encouraged by their superiors to keep diaries throughout the war. This study aims to illuminate a relatively less known section of the Anzac and Turkish history which is buried in the unpublished private accounts of the common soldier. Works Cited: Alcock, Private H.T.C., File No. 12/11/235. Australian War Memorial, Canberra 1915. Aristotle, Poetics, Trans. S.H. Butcher, Hill and Wang, New York 1961. Bakhtin, Mikhail. Rabelais and His World, MIT Press, Cambridge 1968. Bergson, Henri, Laughter: An Essay on the Meaning of the Comic. Trans. Cloudesley Brereton. New York: 1911, Macmillan. Brown, Katherine and Elina Penttinen, “A ‘Sucking Chest Wound’ is Nature’s Way of Telling You to Slow Down: Humor and Laughter in War Time”, Critical Studies on Security, vol. 1.1, June 2013, pp. 124-126. Chandler, Adam, “Remembering Umberto Eco”, The Atlantic, Feb 19 2016. Dodd, Arthur William. MSS:0818. File No: 419/27/12. Australian War Memorial, Canberra. Eco, Umberto, “The Art of Fiction No 197”, Interview by Lila Azam Zanganeh, The Paris Review, no. 185, Summer 2008, p. 124. Frye, Northrop, Anatomy of Criticism, Oxford University Press, Princeton and Oxford 1971. Haworth, Paul, PR0156, Papers of Corporal Paul Haworth, Australian War Memorial, Canberra. Hobbes, Thomas, Leviathan or, the Matter, Forme and Power of a Common-Wealth, Ecclesiasticall and Civil, Barnes and Noble, New York 2004. Üngör, Uğur Ümit, “Funny as Hell: The Functions of Humor During and after Genocide”. European Journal of Humor Research, no 3.2.3, pp. 80-101. Kemaloğlu, Azer Banu, “Düşmanlıktan Kalıcı Dostluğa: Türk ve Anzak Askerlerinin Günlüklerinden Kültürel Yansımalar,” Çanakkale Araştırmaları Türk Yıllığı, V. 15, Çanakkale Güz 2013, pp. 145-47. 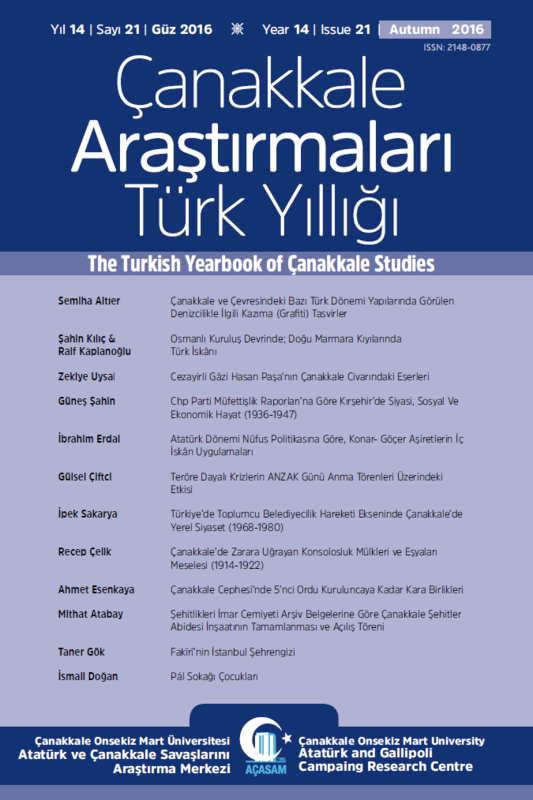 --“From Hostility to Lasting Friendship: A Study of the Anzac and Turkish Soldier’s Personal Narratives”, In Çelikel, M. A. & Taniyan, B. (ed.) English Studies: New Perspectives, Cambridge Scholars Publishing, Newcastle Upon Tyne 2015, pp. 23-35. Kitson, Henry, MS4540. Wellington National Library, New Zealand 1915. Lott, Leslie, MSS1122, Australian War Memorial, Canberra 1915. McLarty, L.T. H.R, 3DRL3339. Australian War Memorial, Canberra 1915. Plato, Philebus, (Trans. J.C.B. Gosling), Clarendon Press, Oxford 1975. Prior, Robin, Gallipoli: The End of the Myth, Yale University Press, New Haven and London 2009. Saunders, Charles W., MS7336-1 Wellington National Library, New Zealand 1915. Tennyson, Alfred. “Charge of the Light Brigade,” Tennyson a Selected Edition, Christopher Ricks (Ed. ), Routledge, New York 2007.